The first step in almost any electrical project is to check for power to make sure the circuit or device is safe to work on. You can do this with a variety of inexpensive testers or even a multimeter. Standard probe-type circuit testers, such as neon circuit testers, voltmeters, and multimeters, have two wire leads with probes for checking circuit wiring or electrical devices. When you insert the leads into an outlet or touch them to a switch's screw terminals, a light or readout will indicate whether or not the device has voltage. An even simpler (and decidedly safer) type of tester is a non-contact voltage tester, which doesn't even need to be inserted into an outlet or to touch bare wire connections; merely bringing the sensor close to a power-carrying wire or device will cause the tool to light up or make an audible noise to indicate the presence of power. There are also plug-in outlet testers with three small different-colored neon lights. These testers simply plug into an outlet and can check for an open neutral, lack of a ground, wires on the wrong terminals, or no power. A specific pattern of lights indicates each condition, and a chart on the top of the tester tells you how to interpret the light pattern. 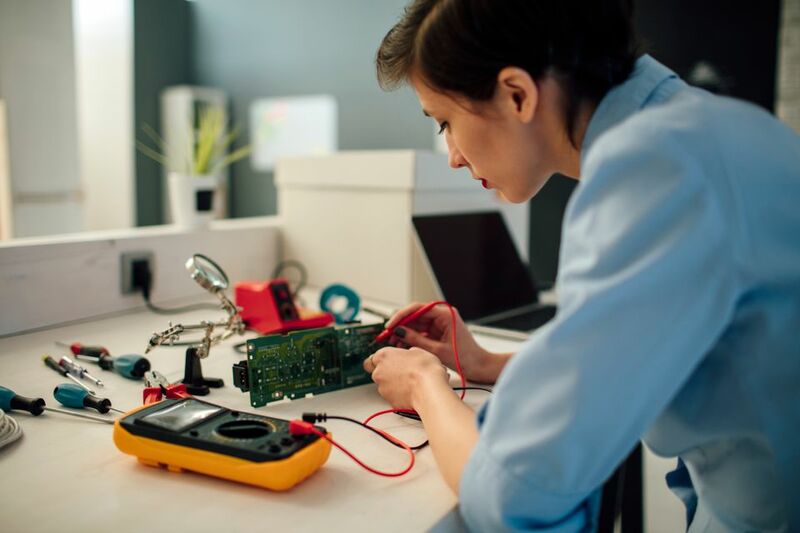 While simple voltage testers can test only for the presence of voltage, multimeters have multiple testing functions and can measure voltage, ohms (for resistance), and amperage (electrical current), indicating quantities on a digital readout or analog dial. Testing to see if the power is on is only one function of a multimeter. Warning: Never tough the bare-metal probe ends of a tester during a test because they may have electricity running through them and can give you a dangerous shock. Also, never let the probes touch each other during a test. Always check to see if the tester is working properly before using it to check for voltage. The easiest way is to go to an outlet on a circuit that you know is live (has power). Insert the tester leads or sensor into the outlet slots. If the tester lights up, it's working fine. If it fails to light up, the tester is bad or needs new batteries. A typical outlet receptacle has three holes in its face. The shorter straight slot is the “hot” lead and connects to the active hot wire in the outlet box. The longer straight slot is the “neutral” lead and connects to the neutral circuit wire in the electrical box. The slot that looks like a small D-shaped hole is the ground slot, and it is connected to the circuit ground wire. To test an outlet for power, turn off the power to the circuit at the circuit breaker. Insert the two probes of the tester into the two straight vertical slots on the receptacle. If the power is on, the tester will light. Because there is a possibility that the outlet is "split-wired"—with the top and bottom halves of the outlet fed by different circuits—always check both halves for power before removing the receptacle to work on it. You can also test to see if the ground system is properly connected to the receptacle. To test the ground, make sure the power to the circuit it on. Insert one tester probe into the hot (short, straight) slot and the other in the ground (D-shaped) slot. If the circuit is working and you have a good ground connection, the tester will light. To test a switch for power, turn off the power to the circuit at the circuit breaker. Remove the switch's cover plate and flip the switch's toggle so the switch is on. Carefully touch one probe of the tester to one of the screws on the side of the switch. Touch the other probe to the bare copper ground wire or the ground screw on the switch (you can also touch this probe to the electrical box if it is metal, but this test works only if the metal box is properly grounded; plastic boxes are not grounded). Next, touch one probe to the other screw terminal on the switch and touch the other probe to the ground wire or screw. Flip the switch's toggle to off and repeat the same tests. If the tester does not light for either test, the switch is not getting power. When checking light fixture wiring for power, turn off the power to the circuit at the circuit breaker, then loosen the mounting straps holding the fixture to the ceiling box and pull the light fixture slightly away from the ceiling box for testing. Always test twice—with the fixture's wall switch on and with it off—because the fixture may get power in either position. To test for power with a non-contact voltage tester, touch the sensor tip of the tester to each of the circuit wires. If the tester lights up when touching any of the wires, the circuit still has power. To test a fixture for power using a probe-type tester, you need access to the fixture's screw terminals or, if the fixture has wire leads, to the ends of the wire leads. Touch one tester probe to the hot (black or red wire) screw terminal, and touch the other probe to the neutral (white wire) terminal. If the tester lights up, the fixture still has power. If the fixture has wire leads connected to the circuit wiring with wire connectors (wire nuts), stick one probe into the connector for the black (or red) wires and the other probe into the white-wire connector. If the tester does not light up, confirm the test by carefully untwisting each wire connector—without touching the bare-metal wire ends or letting different-colored wires to touch—then touching each probe directly to the group of black (or red) and white wires.